Though last Christmas brought Robert De Niro back to the boxing ring in disappointing fashion with Grudge Match, a new boxing drama might fare better. Hands of Stone will feature De Niro as boxing trainer Ray Arcel, the man behind Panama-born fighter Roberto Duran, who made his professional boxing debut in 1968 as a 16-year-old. In 1980, he defeated Sugar Ray Leonard to capture the WBC welterweight title, but shocked the boxing world by returning to his corner in a rematch, saying "no mas," and eventually quitting the sport. Now we have the first photo featuring De Niro with Edgar Ramirez as Duran. Look! Hands of Stone is written and directed by Venezuelan filmmaker Jonathan Jakubowicz. 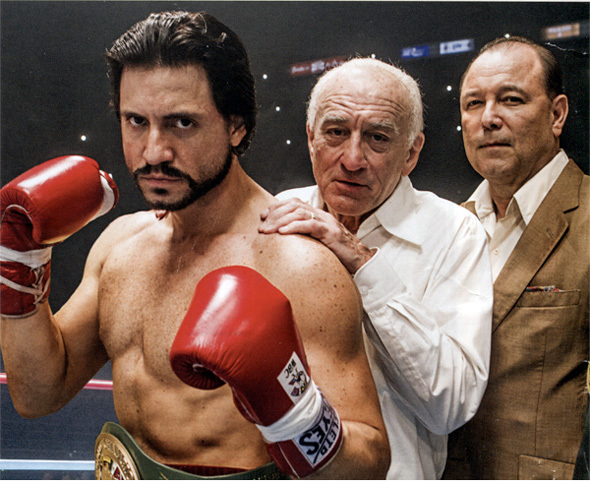 The film will follow the boxing career of Roberto Duran (Edgar Ramirez) with his trainer Ray Arcel (Robert De Niro) leading up to the pinnacle, career-ending fight when a rematch with former welterweight champion Sugar Ray Leonard prompted the fighter to surrender by saying, "No mas." Jakubowicz says, "The infamous 'no mas' fight is the biggest enigma in the history of boxing. This movie will answer that enigma." Ruben Blades, Ellen Barkin, and John Turturro also star in the film being sold at the European Film Market, looking for a release date. Duran was an epic fighter, who had a bad last major fight. Hopefully this film won't do too much to further humiliate the man. I have a sick feeling this is how De Niro really looks.